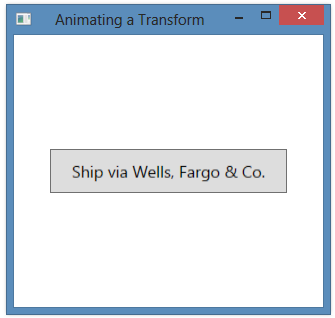 Here’s another example of an animation of a 2D transform. In this case, we animate the scale of the object so that it grows larger and smaller and then repeats the behavior. This results in a sort of pulsating button. <Button Content="Ship via Wells, Fargo &amp; Co." HorizontalAlignment="Center" VerticalAlignment="Center"